Come join us on the third annual GABC Senior Adult Road Trip! Last year's trip through the Olympic Peninsula and northwest Washington was a bit challenging due to a number of wildfires burning throughout the state, but they say the third time's the charm, right? So this year, we're returning to Washington to spend two nights and days in the Spokane and Couer d'Alene, ID area. On the way, we'll travel through central Oregon and Washington and spend the first night in Goldendale, WA. 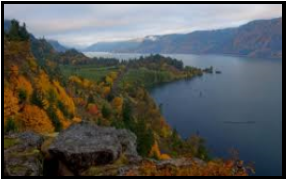 On the return trip, we'll stay in Pendleton, OR and then drive through the beautiful Columbia River Gorge and down through the Hood River Valley back home to Corvallis. A tentative "guide" to the places we'll see and things we'll do is provided below. We also will enjoy a short Bible study time each day led by Pastor Don. We're trying to keep the cost of the trip the same as in previous years -- $350 per person. This covers transportation, four nights' lodging, breakfast each morning and all admission fees. Individuals are responsible for their own lunch and dinner, plus any souvenirs purchased along the way. The church bus will hold 20 people (plus the driver) and we will need to "fill the bus" to keep the cost at $350 per person. We need to collect a $100 non-refundable deposit from everyone intending to go by June 3. The remaining balance will be due Aug. 1. If you or anyone you want to invite and encourage to go on the road trip have any questions, please feel free to contact Carol Reeves at 541-908-3765 or carolreeves.clr@gmail.com. 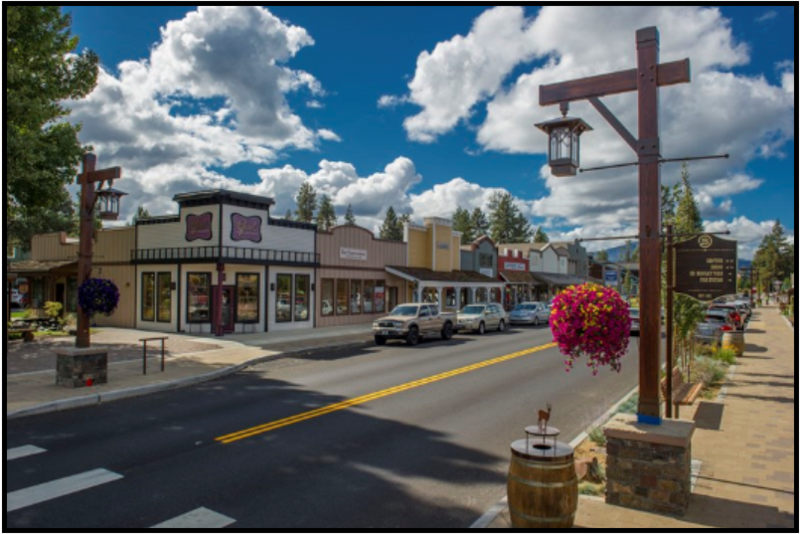 On our first day, we'll travel across Santiam Pass to Sisters and stop for lunch and maybe, a little shopping? Then we'll continue to drive through Warm Springs and the historic ghost town of Shaniko, where rumor has it there's an ice cream shop waiting for us to stop. We'll cross the Columbia River and spend the first night in Goldendale, WA. Tuesday morning we'll continue north through central Washington passing through Ellensburg and Yakima. By mid-afternoon, we'll stop to check out the view of Dry Falls, a geologic wonder which though dry now used to be the site of the world's largest waterfall -- twice as high and three times as wide as Niagara Falls. Another hour on the road and we'll be at the Grand Coulee Dam where we'll enjoy the dam's laser light show once the sun goes down. This will be a long day as we still have another 90 miles to drive after the light show to arrive at the riverfront Doubletree Hilton Inn in Spokane where we'll spend two nights. On Wednesday, after a leisurely hot breakfast buffet, we can walk (or take a short drive) to the Spokane Riverfront Park which is right next to our hotel. 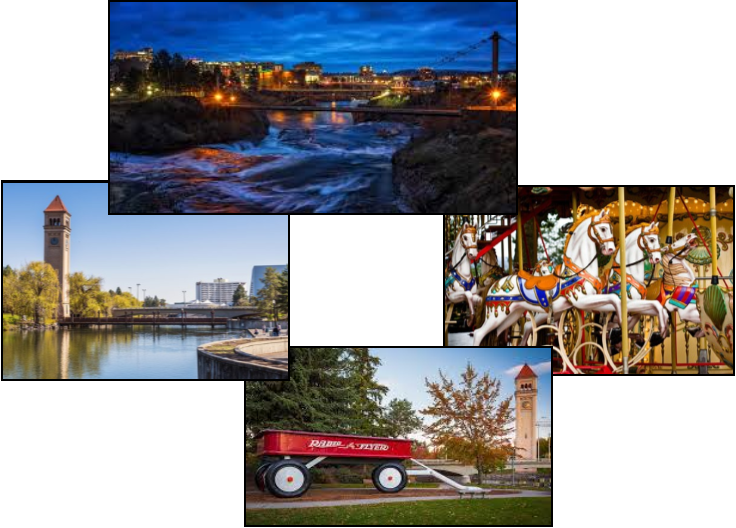 Five major redevelopment projects over the past few years has made the park even more beautiful and offers such attractions as the hand-carved Looff Carrousel, gondola SkyRides across the Spokane River Falls, a giant Radio Flyer red wagon and much more. Other sights to see in Spokane include Manito Park, Bing Crosby House Museum and nearby, the Cat Tales Zoological Park and Wildlife Rescue Center. (We may visit some of these attractions on Thursday . . . .) We hope to end our third day with a sunset dinner cruise on Lake Coeur d'Alene. Once we finish our sightseeing in Spokane, we'll head south through The Palouse, a scenic farming area in eastern Washington. We'll stop for a break at the Palouse Falls State Park. Then we're headed to Pendleton to spend our last night on the road. Friday morning, we'll try to squeeze in a tour of the Pendleton Woolen Mills Blanket Factory and Store before we head west toward home. We'll have lunch somewhere along the beautiful Columbia Gorge and then turn south to follow the Hood River "Fruit Loop Tour." We'll stop at a variety of fruit stands, country stores and specialty farms along the way. There should be room on the bus, if you want to load up some produce for fall canning and freezing. It will be harvest season for peaches, pears, apples, sweet corn, tomatoes, herbs and lavender. After one last supper together, we'll arrive back in Corvallis sometime between 8 and 9 p.m.